During this webinar I discuss how to be aware of and work with your parts in real time, at the moment when they are activated in your life. Develop the skills to notice when a part is triggered, access it, and learn about it. Learn how to separate from a part and get into Self. Learn how to reassure a protector or comfort an exile. This is a different set of skills from what it takes to do an IFS session. 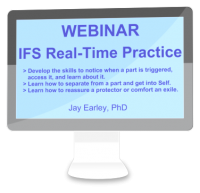 (1) People who already know how to do IFS sessions or are in IFS therapy because the skills enhance your ability to work with your parts between sessions. (2) People who are new to IFS, because these are beginning skills for working with your parts.